This crankset looks like a traditional oldfashioned part for use with cotter pins but fits onto more modern square section bottom brackets. Choose from 44 or 46 teeth. 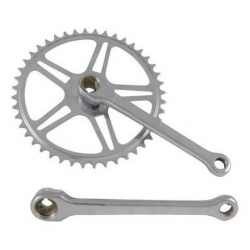 For single-speed / hub gear usage with a 1/8 inch chain.